In 1870, General William J. Palmer, who was to found Colorado Springs in 1871, organized the Denver Rio Grande Railroad, and in 1871 began construction on that line. When the Denver & Rio Grande finally reached Leadville (by a southerly route through Pueblo and Canon City) in 1880, freighting on the Ute Pass Wagon Road declined rapidly. 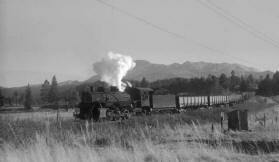 It was about this time that the idea of a railroad through Ute Pass was born. Colorado Midland Railroad Company (CMRR) was organized in 1883 by the owners of Aspen’s Robert E. Lee Mine. Their project lay dormant until 1886, however, when James J. Hagerman (owner of Aspen’s Gibson Mine) became enthused with the idea and raised the money needed to build the railroad. Construction began on the Colorado Midland in 1886, and a heated competition with the Denver & Rio Grande ensued to see which would be the first to reach the rich silvr mines of Aspen. New towns—Cascade, Chipeta Park, Green Mountain Falls, and Manitou (Woodland) Park—were spawned every few miles as the railroad clung to the granite walls of Ute Pass and then climbed into Pikes Peak’s backcountry. 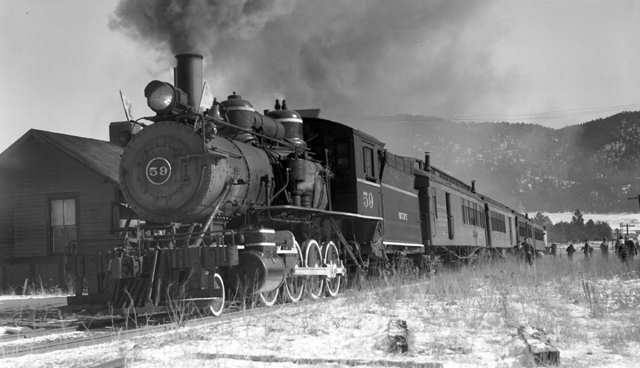 In March 1887, construction of the Colorado Midland had already reached Florissant, but it did not arrive in Aspen until January 1888, sixty days after the Denver & Rio Grande. Colorado Midland Railroad was the first standard gauge railroad to penetrate the steep mountain grades of Colorado’s Rockies. It crossed the Continental Divide at Hagerman Pass (named for the CMRR’s founder). Hagerman outfitted his new railroad with twenty-two locomotives, thirty-five passenger cars, and 1,000 freight cars. The Midland consisted of over 300 miles of track, with some sections of 4% grade where it crossed the Continental Divide at 12,000 feet. However, standard gauge railroads were not efficient at any grade over 2%, and this engineering flaw led to the Midland’s demise in 1918.